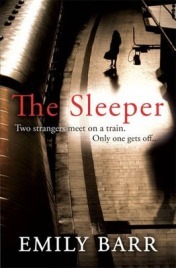 The Sleeper is a tense and exciting novel that had me hooked from the very first page. Emily Barr writes in a clever way that slowly and tantalisingly reveals details that make it very hard to predict what is going to happen. This is exactly what I want as a reader and it’s the promise of all these slight revelations that make me keep reading. It is also an absorbing story with many sub plots running alongside each other. I found Iris to be a particularly interesting character and her own story is especially poignant. I also liked the fact that much of the story at the start of the book was set on the sleeper train and it was fascinating to read of this ‘other world’ and the camaraderie between all the passengers as they set off on their journeys. Emily Barr is one of my favourite authors and her writing never disappoints. Each book is new and fresh and there is nothing predictable or formulaic about her stories. This is about the tenth book I have read from her and I am still left wanting more. Thanks to the publisher for sending a review copy. No Comments on "The Sleeper"